William B. Hanley has been in practice since 1974 in a wide range of legal practice areas, including employment law, environmental law, personal injury (including nursing home neglect and abuse), and trust, business, commercial, real estate, and construction litigation. Bill was selected as the 2002 Business Litigation Trial Lawyer of the Year by the Orange County Trial Lawyers’ Association. He represents both individuals and businesses with a determination to solve their legal issues and to achieve optimal results in every case. Bill works closely with each client and provides a personal involvement in each client’s unique issues. He is an experienced legal professional who takes pride in being properly prepared for every case. Bill prides himself on having played David to many legal Goliaths over the years. Although he has represented several Fortune 500 firms, he relishes the opportunity to represent the smaller companies that have been trampled by those larger and more powerful. His no-nonsense approach may very well be the product of the large-family, small-town atmosphere in which Bill was raised. He was one of six children, and his father worked in the steel mill of Sharpsville, Pennsylvania, a town of 6,000 people. Bill remembers his high school principal calling him into the office when he was in trouble. The principal asked him what he wanted to be when he grew up. “A lawyer,” Bill said, without knowing why. “You’ll never make it,” the principal told him. That was enough to fuel the desire. After he graduated from Pittsburgh's Duquesne University, his aspirations were interrupted while he served a tour of duty in Vietnam with the Army's 101st Airborne. He returned in 1970 to Ft. MacArthur in San Pedro. 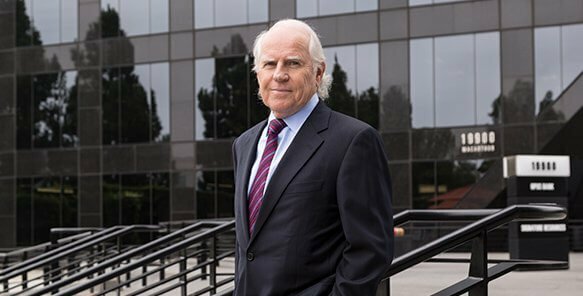 Deciding to remain in California, he attended Pepperdine University School of Law and graduated in 1974 to join the Costa Mesa firm of Russell Behrens, where he became partner in 1978. I enjoy working with small businesses and small companies. You develop a real personal relationship with these people. They become clients as well as friends.